Winky the Frog is an amphibian Animal Friend with a high jumping ability in Donkey Kong Country. It is the only playable appearance that he has, and therefore has the least out of the mountable Animal Friends of the Donkey Kong Country and Donkey Kong Land franchise. Winky was succeeded by Rattly the Rattlesnake in the game's sequel, Donkey Kong Country 2: Diddy's Kong Quest, as well as Donkey Kong Land 2. Winky in his featured stage, Winky's Walkway. In Donkey Kong Country, Winky only appears in a few levels, three of which are in Monkey Mines. He first appears in Winky's Walkway, which is named after him. As the level's name implies, Winky is the main feature. Winky has the ability to jump higher than the Kongs, which is useful for reaching collectibles such as Bananas or Extra Life Balloons. He has the ability to defeat Zingers by jumping on them. His second appearance is in Bouncy Bonanza, and his Animal Crate appears in a small room shortly after the Star Barrel. He can jump high enough to enter the last Bonus Area of the level. Winky's third appearance is in Millstone Mayhem, and his crate is located on a pathway that can be reached via a Tire. He is last found in the first Bonus Area of Rope Bridge Rumble, of Gorilla Glacier. 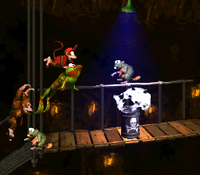 In Donkey Kong Country 2, a Winky figure makes a cameo in the background of the Monkey Museum, priced at five dollars. This cameo was removed from Cranky's Hut in the Game Boy Advance remake, although a small Winky is contained in a cage, which it hops around in. These smaller variants also hop around in the swamp-themed stages of Krem Quay. Cranky also mentioned Winky and Expresso in the Super Nintendo version's instruction manual by saying, "A more tragic looking bunch of useless no-hopers you'll never see! I liked Expresso and Winky--where have they gone?". His appreciation of both Animal Friends is shown from their figurines in his Monkey Museum, or keeping a pet of each in the Game Boy Advance remake. Cranky mentions both Animal Friends again in the Donkey Kong 64 instruction manual in hopes of their reappearance, "I just hope they've included poor old Winky and Expresso this time instead of that bone-brained rhino that always seems to get in the games." In Donkey Konga 3: Tabehōdai! Haru Mogitate 50 Kyoku, multiple Winkys appear swimming in the waters of the campground portion of the summer background. In the Club Nintendo comic "Donkey Kong in: Banana Day 24", Cranky and Kiddy Kong are briefly seen riding Winky to an airport. In the Donkey Kong Adventure story of Mario + Rabbids Kingdom Battle, the design of Rabbid Cranky's Croaker Disposer is based on Winky the Frog. The weapon's flavor text reads: "Whether it's Monkey Mines or monkey shines, Winky is always BOUNCING with enthusiasm." The weapon is also described as an officially licensed Barrel Bolt. Winky appears as a spirit in Super Smash Bros. Ultimate. SNES Donkey Kong Country (11/1994) NA: The Kongs have all kinds of animal friends. Mammal friends, fish friends, bird friends. Winky is a frog. He defeats those pesky Zingers by bouncing on top of them. You might worry about falling off that slippery back of his, but all concern will wash away as you are hopping through the skies. PAL: The Kongs' Animal Friends come in all shapes and sizes. There are mammals, fish, birds... There's even a frog! Winky's high-hopping abilities make him really useful when it comes to taking out those pesky Zingers. Best of all, you don't need to worry about accidentally falling off that slippery back of his - it just never happens! A Winky Token in Donkey Kong Country. Donkey Kong Country game designer Gregg Mayles expressed a dislike of Winky as a player character, sarcastically saying "[Rattly and Winky] had rubbish controls and hits to test player skill. Good design." 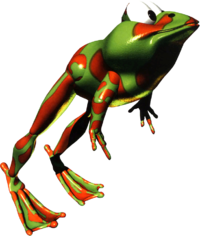 Gregg's brother and Donkey Kong Country character designer Steve Mayles similarly stated "it was always best to never get on the frog." In Banjo-Kazooie: Nuts & Bolts for the Xbox 360, there's a large vehicle shaped like a frog called 'Big Winky', presumably a reference to Winky the Frog by Rare Ltd. (who developed both games). ↑ Steve Mayles on June 23, Twitter. This page was last edited on February 19, 2019, at 15:40.